The new picture book, “The White Gorilla and the Three Chimpanzees…a day from the zoo!”, written by Saragine Francois and illustrated by Brian Rice, is an adventurous book featuring four animals who have decided to leave the safety of the zoo and find out what lies beyond. Curious about the human world, Chef, the white gorilla, and his three chimpanzee friends, Dancer, Brainless and Smarty find both trouble and fun while they investigate the oddities of human life. During their trek, Chef and his friends share many new experiences, such as attending a birthday party, driving a car and grocery shopping. Told with humor and wit, the story is sure to draw a chuckle from both parents and children as they watch these primates acting silly and finding themselves in the most unusual circumstances. As for the illustrations, they are extremely colorful and express perfectly the scenes from the text. You could almost follow the storyline without the words since the illustrations do such a good job of telling the story. You can clearly see the personalities of each character, even if their names didn’t give you clues. Your little one will have no trouble pointing out which chimps are Dancer, Brainless and Smarty…and they will probably do it while giggling. The story itself is written in a simple fashion that is easy for children to follow, but manages to introduce new words that your child may not be familiar with yet. This gives parents the opportunity to use reading time not only for pleasure, but as a learning experience as well. The first time I read through this story I did feel like it ended rather abruptly, but upon my second reading I realized that this may have been intentional on the author’s part. By ending the story where she does, she really makes you think about the ending and asks you to consider that maybe what we fear isn’t really a threat, but is simply new and currently outside of our comfort zone. A thought that is as true for us adults as it is for children. 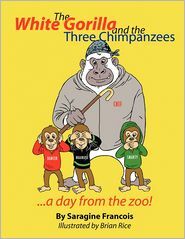 If you would like to find out more about “The White Gorilla and the Three Chimpanzees” for yourself, you can watch the book trailer on YouTube, or read some of the other book reviews on Amazon or BarnesandNoble.com. The book is currently available as a traditional paperback or eBook. < Another book being published! This looks awesome! I can’t wait to get one for my grandson. He loves monkeys and I love apes, gorills, and orangatans. PERFECT! Thanks. It really is a cute story, I hope you and your grandson will enjoy it! Thanks for stopping by and reading my blog!